Studying vacuum system designs can be difficult, since some analysis methods only work when the relative speed of the gas molecules is very large compared to the velocity of the enclosing walls. This is not the case for turbomolecular pumps, which we can model and analyze using a Monte Carlo approach and the Rotating Frame feature in the COMSOL Multiphysics® software. Let’s check out one example below. Vacuum technology is found in many high-tech applications, including semiconductor processing, mass spectrometry, and materials processing. This technology creates low-pressure environments by using vacuum pumps to remove air molecules from enclosed vacuum chambers. 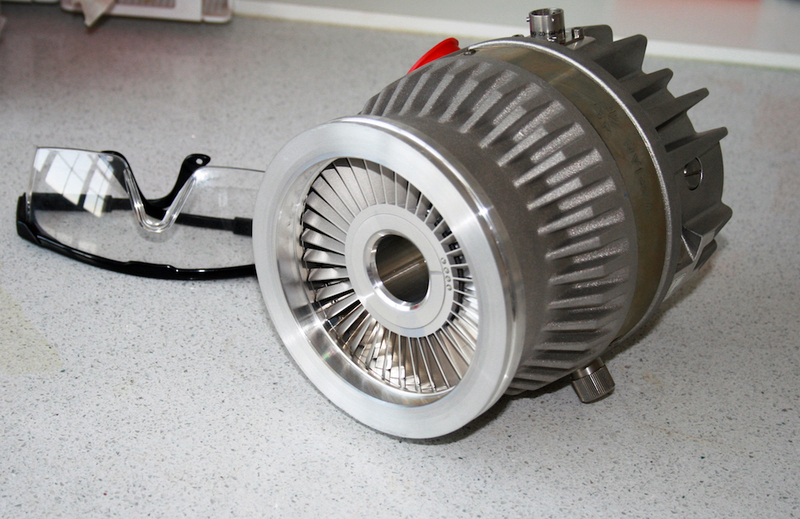 One type of vacuum pump is a turbomolecular pump, which consists of a bladed molecular turbine. The blades of modern turbomolecular pumps rotate extremely quickly, reaching speeds as high as 90,000 rpm. The momentum transfer from the rotating blades to the gas molecules compresses the gas, which is moved from the inlet to the outlet by the blades. As a result, the pump is able to generate and maintain a high vacuum on the inlet side of the blades. This pumping process is more efficient in the free molecular flow range, since the gas particles mostly collide with the rotor and not with each other. To better understand and design turbomolecular pumps, you can model them with COMSOL Multiphysics. But first, let’s figure out the best way to do so. Instead of focusing on the whole turbomolecular pump, our model geometry depicts part of a single turbomolecular pump stage (a row of blades). Using the model, we calculate gas molecule trajectories in the empty space between the blades. This enables us to assume sector symmetry in the modeling domain. Model geometry of one sector of one stage of a turbomolecular pump. 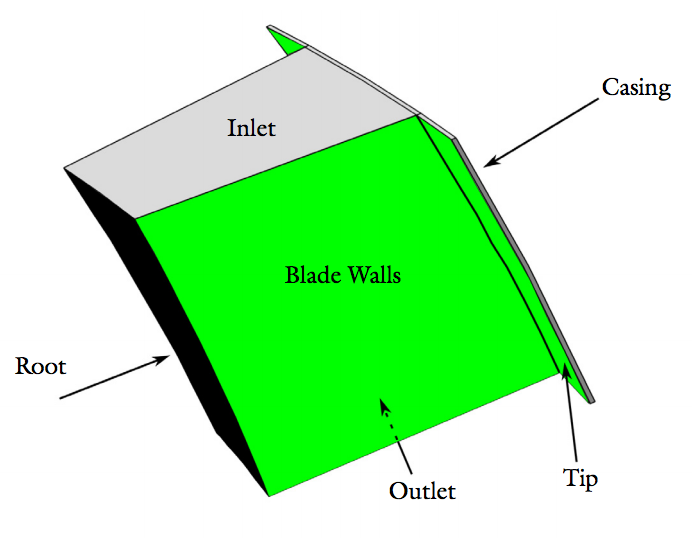 Gray represents the space between two blades, green represents the blade walls, and black represents the rotor root. While we don’t use it here, one way to solve the model equations and calculate the pump’s performance in a free molecular flow regime is with the Free Molecular Flow interface from the Molecular Flow Module. This interface is an efficient option and is useful in cases where the molecules of extremely rarefied gases move significantly faster than any object in the modeling domain. However, in turbomolecular pumps, the speed of the gas molecules is comparable with the blade speed. As such, we need a different approach for this problem. The turbomolecular pump example model. We use a Monte Carlo approach and the Rotating Frame feature (new to the Particle Tracing Module in version 5.3 of COMSOL Multiphysics) to automatically apply the fictitious Coriolis and centrifugal forces to the particles. This enables us to compute the particle trajectories within a noninertial frame of reference that moves along with the blades. This method provides accurate results on how the blade velocity ratio affects the pumping characteristics, such as the maximum compression ratio, transmission probability, and maximum speed factor. 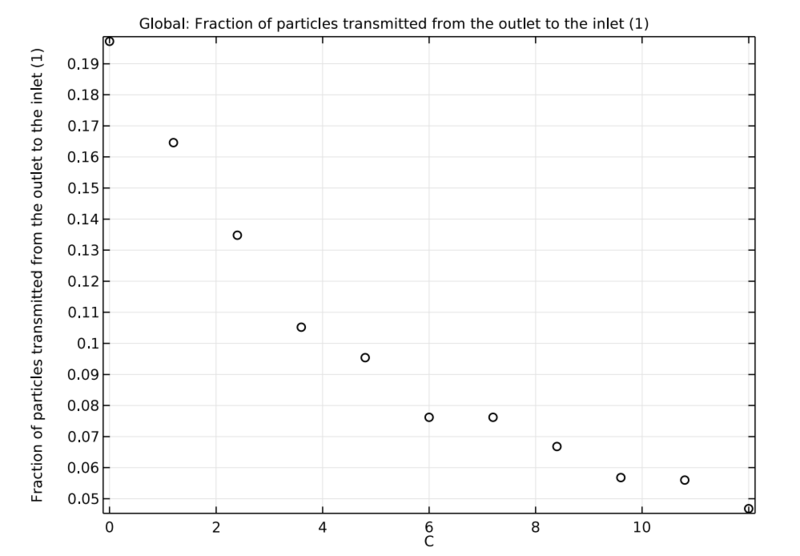 We base these characteristics on the transmission probability of argon atoms from the inlet to the outlet and vice versa. For more information on how we created this model, including the geometric parameters and assumptions, check out the documentation for the turbomolecular pump tutorial. 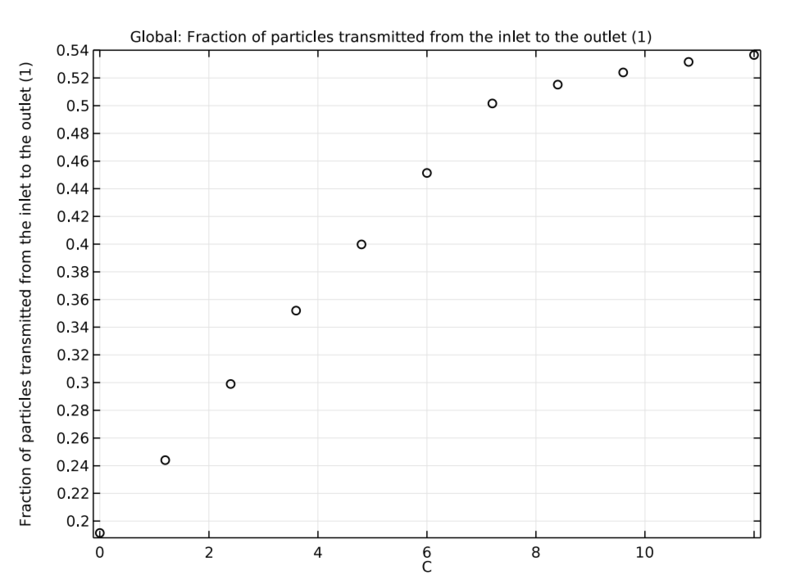 Let’s begin by computing the transmission probabilities for particles propagating in the forward (inlet to outlet) and reverse (outlet to inlet) directions. As expected, when the blades are at rest, these probabilities are about equal. This is because there is no distinction between the two directions. However, when the rotation of the blades begins to increase, the particles are more likely to be transported forward through the pump, as the walls successfully transfer momentum to the argon atoms. 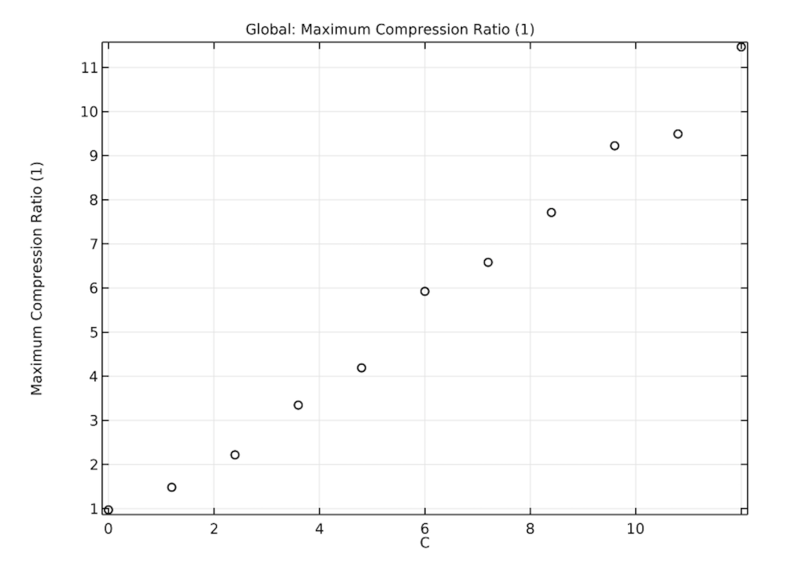 This corresponds to an increasing compression ratio. The fraction of particles transmitted in the forward direction (left) and the reverse direction (right) as a function of blade velocity ratio. We also investigate how the compression ratio and speed factor are affected by the blade velocity ratio. To produce enough compression and speed, pumps use multiple bladed structures comprised of several disks and different types of blades. Blades close to the inlet have a high pumping speed and low compression ratio, while blades close to the outlet have the opposite characteristics. 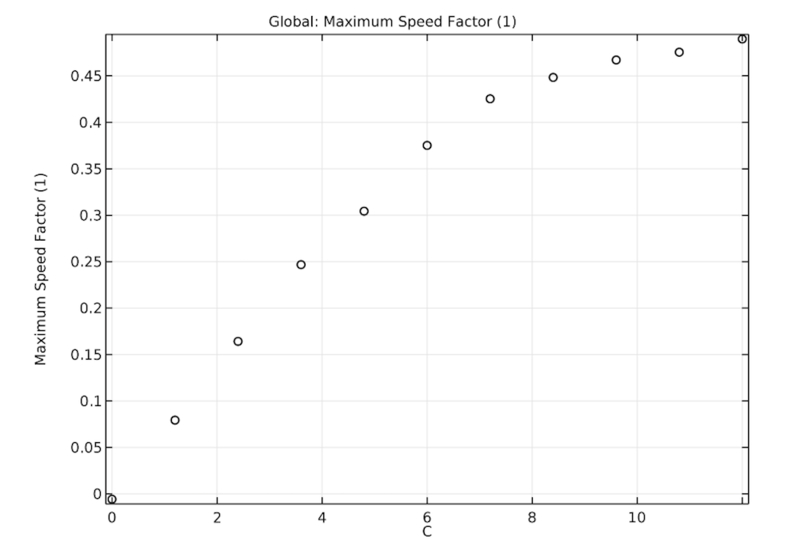 When the velocity of these blades increases, as seen in the plots below, the maximum compression and speed factor increase. This confirms that the two blade types work together to enhance the performance of the pump. The effect of blade velocity on the maximum compression ratio (left) and maximum speed factor (right). 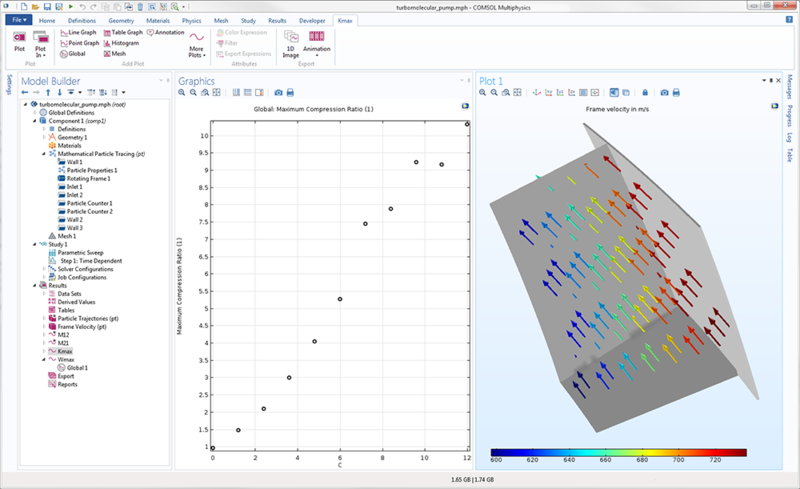 This example highlights the new modeling features that enable you to more easily analyze turbomolecular pumps. Try it yourself by clicking on the button below.